Would you like your college applications to “wow!” colleges and create a superstar effect? 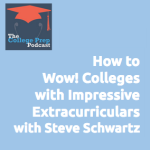 Steve Schwartz is an expert in how to help students create a college admissions application that knocks the socks off school around the country. Steve learned the hard way his own college search process back in the early 2000’s. As a high school sophomore, he sent over 200 emails to nonprofits looking for an internship. Although he only heard back from 15 of these organizations, he wound up being offered an impressive experience with the UN that launched some other interesting high school experiences and paved the way for his acceptance into Columbia University. During this episode, Steve breaks down how he helps his clients create the “superstar wow! effect” for themselves. Listen in, and then check out Steve Schwartz’s new podcast The College Admissions Toolbox, chat with him on reddit or twitter, or read his tips at the Get Into College blog.